Fill in your details below and we will let you know within 24 hours if we can get Sentinels of the Multiverse: Enhanced Ed to you with haste! A mad scientist holds the world hostage with his terrifying inventions. An alien warlord from a far away galaxy brings his limitless army of bizarre minions to conquer the planet. A giant rampaging robot cuts a swath of destruction across the coast, destroying major population centers. And who will stand in their way? 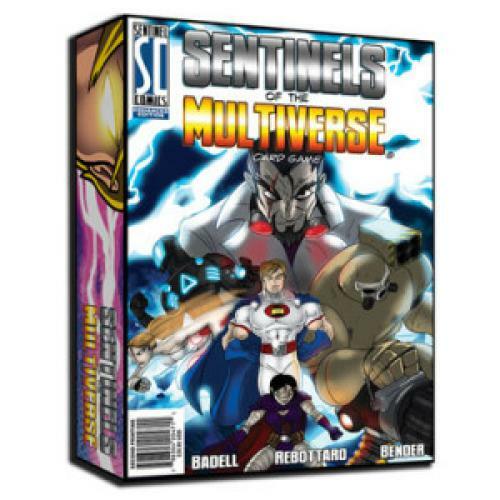 The Sentinels of the Multiverse: Enhanced Edition features a much larger box than our original print run, with enough space to hold 578 cards and still have room for all the cards from both the Rook City and Infernal Relics expansions. The Enhanced Edition also features 36 divider cards, one for each hero, villain, and environment from the core game, both expansions, and even promo characters! The 120 round tokens and 42 rectangular tokens are useful for tracking hero and villain HP, as well as conditional modifiers that can occur throughout the game. The game also includes a 20 page rulebook, complete with instructions, diagrams, a quick-start guide, and even bios of the heroes and villains!